Are you looking for the best kitchen faucets to suit your home? We often take faucets for granted but it’s essential you choose the most efficient faucets possible. As someone who has reviewed pull downs, pull ups, center set, basin taps and other types of faucets, I can tell a good faucet when I see one. I chose these ten based on their flow rate, ease of use and versatility. I also took into consideration the installation process and how compatible the faucets are with different types of kitchen sink set ups, i.e. the more versatile the better. Without further ado, I give you my reviews of the top ten kitchen faucets your money can buy. The Moen Arbor kitchen faucet is a high quality product that combines hands free technology with ease of installation. The Moen Motionsense is equipped with two sensors that trigger water flows via your hand movement. It’s a hands free design so it minimizes cleaning without compromising efficiency. Its Reflex System and 68 inch hose give you infinite maneuverability and flexibility so the faucet is easier to use. No matter where you turn the faucet it always goes back to its original position, saving you the trouble of putting it back on. It also has automatic docking so it’s more convenient. With its Duralock Quick Connect Installation System you’ll have an easier time installing the faucet. There is no need to use tools and water lines are secured quickly. With its Power Clean technology you’ll get more water pressure without having to put up with excess splash. Using the Power Clean technology the faucet is able to generate the power necessary to remove kitchen spills, sticky substances and residues. There are two spray patterns, an aerated stream for daily use, and a high pressure rinse when more powerful cleaning is required. The Moen Arbor kitchen faucet lives up to its claim of being easy to use and reliable. Its MotionSense produces water flow consistently and the easy maintenance is a plus. The 9178-AR-DST is a stainless steel faucet designed for convenience and ease of use. Part of the Leland Kitchen Collection, it uses the latest technology for efficiency. With Touch Clean you won’t see as much build up of minerals. It has soft rubber spray holes that makes it easy to remove mineral residue and keep the faucet clean. The LED light color varies so you’ll know if the batteries need replacement and the state of the water’s temperature. This removes the guesswork when running and maintaining the faucet. This state of the art magnet is built in, ensuring the spray wand docks properly when you’re not using it. This also keeps the faucet in the best shape possible. This faucet has been designed so you can install it in sinks with 1 or 3 holes. There is a deckplate included if you want to use that. There are two spray options, stream or spray, allowing you to wash and clean the way you want. Just switch to the desired mode. Its battery life is good for 2 years so there is no need to buy frequent replacements. There is also an AC adapter if you prefer to run it via electrical power. ​This is a well designed faucet, with excellent craftsmanship, solid features and provides excellent water pressure, ideal for different uses. The WEWE Kitchen Faucet sports a clean, streamlined design that’s compatible with most common kitchens. The faucet is also equipped with features that make cleaning easier. The WEWE faucet has three functions, spray, stream and pause. You can easily switch between spray and stream, and by pressing and holding pause you’ll stop the water flow. The installation process takes less than half an hour. You don’t need to call a plumber and since the line hose is already installed, set up is faster. The water flow and volume are controlled with a single handle for simplified use. The faucet also has a swivel spout that turns 360 degrees for maximum maneuverability. It is this feature that provides optimum performance. The WEWE faucet has revamped its mechanical traction system so the sprayer doesn’t go allover the place when you use it. The faucet automatically goes back to its original location. The faucet is designed to be rust resistant and corrosion proof. Its quality finish keeps dirt and grime from adhering to the surface. All you need is a cloth to clean the faucet. The WEWE faucet is easy to install and operates smoothly. All the required components are included and it doesn’t splash water the way other faucets do. The K-560 Bellera combines innovation with style. The emphasis is on functionality but it is also ergonomic and comfortable to use. The faucet has a high arc that swivels 360 degrees. This gives you more flexibility and allows it to clean large pots. Add the multiple function capabilities of the spray head and it works great for extensive cleaning. The faucet sports the MasterClean Sprayface that makes cleaning easy. It also reduces mineral buildup so water flow is consistent. Its 360 degree swivel and spout allows for maximum cleaning of cookware and utensils. Its flow rate goes up to 60 psi and 1.8 gallons per minute, higher compared to those of other faucets. The faucet can be installed in 1, 2, 3 or 4 hole sinks, and it also has an escutcheon if you want to use it. This system keeps the nylon hose quiet and light. The same technology applies to the ball joint so the faucet is convenient to use. The DockNetik docking system has a magnetic mechanism. It is built into the spout that secures the spray head and keeps it smooth and locked. The Kohler K-560 is a good all-around faucet that delivers consistent performance. The spray head touch controls allows for easy use and it’s durable too. The KPF-1602 sports a unique design that provides optimum performance. Made with quality ceramic cartridge and low flow neopearl aerator, it’s designed to produce for the best results. The faucet has single hole mounting so it integrates in your sink quickly. Installation is made simpler as all the essential components are included. The instructions are easy to follow which speeds up installation. The faucet has a 360 degree spout with an open coil design. This provides additional flexibility so the spout reaches all areas of the sink. This makes the faucet more convenient for cleaning. The faucet returns to its original position. The faucet is 100% brass free and doesn’t rust like other faucets. This also reduces the level of maintenance required. A lot of the problems with faucets arise from rust, but here it won’t be an issue. Its pre-rinse sprayer has rubberized nozzles which keep minerals from building up. It is also effective against hard water so maintenance is quick and efficient. Activating the lever allows you to redirect the water flow off the spout while keeping the gpm level constant. The faucet has quality nozzles, smooth lever flow and consistent flow rate. In addition the faucet is UPC certified. The KPF-1602 is a beautifully built faucet that lives up to the hype. It has an intuitive design and its rust resistant is exceptionally good. The Comllen provides ease of use, versatility and comfort. Designed to work with different faucets, it’s also built to last thanks to the stainless steel finish. The Comllen spout can turn 360 degrees, and combined with its high arc you get a good deal of flexibility. This is what allows you to clean pots, dishes, pans and so on. The faucet rotates smoothly but returns to its original position. The faucet is equipped with a durable ceramic disc that keeps water flow smooth, drip and mineral free. The faucet has a brushed nickel finish that keeps it corrosion and tarnish free. So even with regular every day use the faucet won’t corrode and continue to provide smooth water flow. The faucet uses a single lever to manage cold and hot water. Now there’s no need to mes around with multiple levers or buttons. The combination of the 360 degree rotation and a pull out sprayer gives you more leeway in cleaning pots and pans. The faucet is built from quality parts to ensure consistent performance. It has an ABS aerator, brass body and deck mounting for ease of use. Its ceramic valve also improves performance whether hot or cold water. The Comllen faucet installs quickly and the instructions are clear cut. Once set up the faucet runs without a hitch, which is exactly what you need from a facet. The Colony is a stylish looking faucet that offers consistent water flow. ALL its features are designed to make washing and cleaning easier but without compromising flow and durability. The faucet allows you to adjust the spray pattern to match your current needs. Not only can you adjust the spray, but there’s a pause feature. Want to stop the water for a bit? Just press pause and the flow halts. It sprayer is well integrated and easy to redirect. What memory position valve does is remember your chosen water temperature. This means you don’t have to manually adjust the handle every time you use it. This is a convenient feature if you want the water at a particular temperature. The faucet handle lever is steel, and combined with the brass swivel spout gives it extra durability. The brass finish helps keep it durable and ideal for long term use. The faucet is tarnish, scratch and corrosion resistant. The ceramic disc keeps the faucet from dripping and the spray can be adjusted without causing wear and tear. The Colony faucet conforms to the standards set by the NSF and ADA so it is convenient to use. Add to that its long warranty and you’ve got a high quality faucet. The TPC11-TO is built for the modern home that demands reliable performance while still being easy to operate. Its spray head simplifies cleaning and the other features make this better than the average faucet. The TPC11-TO complies with the standards set by the CA AB, ADA, NSF and the cUPC. That means the faucet is certified safe and accessible for everyone. The TPC11-TO has a dual spray system that allows you to stream or spray water. This makes it convenient to clean cookware, and the counterweight mechanism lets you pull the hose back rapidly. The spout can be extended so you won’t have much problem with cleaning. The swivel function adds to the versatility and smooths stream and spray head flows. You can quickly remove off the spout so it’s easier to maneuver. Its waterway is made of brass. This not only makes the faucet aesthetically pleasing but also reliable and ideal for long term use. The faucet has a 1.8 GPM flow rate, so it complies with water saving standards while still providing a good amount of water. The TPC11-TO is a solidly made, fully functional faucet. It’s one of the few faucets that combines style with functionality so water flows seamlessly and consistently. The Pfirst Series 1 faucets are built for the family who don’t want to settle for anything less than the best. With this faucet you don’t have to worry about compatibility or inconsistent water flow. The faucet is up to par with the regulations set forth by the ADA, NSF and Cal. This means the faucet is green, low lead and can be used by those with disabilities. The faucet has a GPM of 1.75 at 60 PSI, which means it conforms to the water saving standards while still providing sufficient water for washing dishes and food preparation. The faucet is compatible with most kitchen sinks and it comes with an escutcheon so you go for that particular configuration if you want. The spray head has a toggle button that lets you switch from stream to spray mode. The ergonomic design makes this intuitive process even simpler. With its 38 inch hose it is more convenient to wash and clean plates. The Pfirst Series faucets conform to all the important standards so you’re assured of its quality. Add the high quality, drip free spout and it is a good choice for anyone who wants a reliable faucet. There are many types of kitchen faucets so how do you figure out which is the right one to buy? Well there are a lot of factors that you’ll need to consider and it is not just the price tag. Faucets come in all shapes, sizes, styles and finishes. The aesthetics is a matter of personal preference, but for the design make certain that it is compatible with your kitchen sink. Whether you opt for a mechanical, classic, modern or industrial look, what’s important is that the faucet is compatible with your kitchen plumbing. The majority of kitchen faucets are made of stainless steel or brass, but other types are available. Whatever finish you choose, make certain that it is rust and corrosion resistant as they are very difficult to remove. Look also for faucets that have spot resistant technology so water spots and fingerprints don’t end up on it. Kitchen faucets will see a lot of use so they must be made of quality materials. The faucet must also be free from lead and conforms to ADA and other regulations and standards. The for rate determines how much water is going to come out of your sink. The flow rates are measured in gallons per minute or GPM. On the average kitchen faucets have a flow rate of 1.5 to 1.8 GPM, but others are higher. Check the product specs before you buy so you will know if it is the right one for your needs. The quality of the valve is also important because this determines how capable the faucet is preventing drips. A lot of these faucets incorporate a ceramic valve since it is one of the most effective and durable. Ceramic valves also handle repeated on/off cycles without suffering wear and tear. If you’re going for a pull down spray head, get one that has a mechanism to prevent it from drooping or dragging after extended use. The top brands have proprietary technology to prevent this so be sure to check it out. A long pull down hose is ideal if you wash a lot of large dishes and pots and you have a large sink. A quality kitchen faucet does more than just provide water. It also makes cleaning easy, and it’s more efficient too. Let’s look at the numbers. Faucet water makes up 15% to 18% of water used in a typical 4 person American household. An efficient kitchen faucet maximizes its use. A household of 3 uses 18 to 26.7 gallons from all faucets daily. An efficient faucet can optimize water usage. A typical household uses 9,750 gallons per year. Faucets with an efficient flow rate can reduce this down to 6,600 gallons yearly. Faucets can be fitted with aerators that reduce flow rates from 2.2 to 1.5, 1.2, 1.0 or 0.5 gallons per minute or down to as much as 1.0 LPM. Remove mineral deposit buildup and don’t let them accumulate. A 50/50 mix of white vinegar and water will do. Wipe the faucet with a damp cloth to remove dirt, grime, stains and grease. Use a toothbrush if deposits won’t come off the aerator. If there’s water on the faucet surface, blot dry it. Be as thorough as possible. Do not allow water to evaporate on the surface as it encourages mineral buildup. Rinse the surface with water if you cleaned it with a water and vinegar mix. Do not use abrasive cleaners or chemicals since it could damage the surface. Q: Can I hook up a water filter or dishwasher to a pull down or pull out faucet? A: No, you must never connect a water filter or dishwasher to a pull out or pull down faucet as the pressure changes in the filter or dishwasher may damage the hose. However you can hook up other kinds of faucets. Q: Is it a good idea to use tankless water heaters with pressure balanced faucets? A: Tankless water heaters have low outgoing water pressure, and that makes it unsuitable for pressure balanced faucets. This is due to the differences in the cold and hot water lines. If the psi pressure on the cold water line is higher than the hot water line it will affect the flow of water. Q: Will my faucet’s finish get damaged if I use drain openers? A: Well made faucets have durable finishes and should not cause damage. To avoid issues you should follow the manufacturer’s instructions. Make certain that the drain cleaner does not linger more than half an hour on the finish. Q: What finishes are available for faucets? A: The most common is stainless steel but other finishes are used. Arctic stainless steel has an icy, glossy finish, while bright stainless steel has a vivid appearance. Brushed nickel is muted and warm while chrome is high gloss and cool. Oil rubbed bronze has bronze highlights with a dark, muted finish. Other faucet finishes include brass, Venetian bronze, white, satin nickel, white chrome and more. Q: What causes a faucet finish to deteriorate? A: The most common cause is wear and tear and prolonged use. This can also happen due to chemicals spilled on the sink or if it’s not cleaned up regularly. It is important that you take care of the finish since that cannot be replaced. 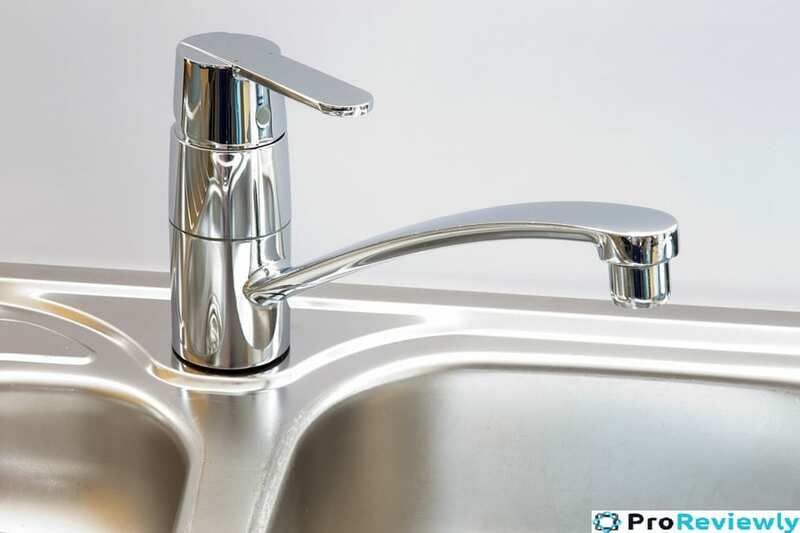 However it is possible to replace other faucet components. Buying a kitchen faucet is simpler than ever as everything is just a few clicks or taps away. But that has led some to make hasty decisions when it comes to buying a faucet, and we know the troubles that come from a leaky, malfunctioning faucet. I prepared this guide so you don’t have to spend hours looking for the best kitchen faucets. Each person will have their own favorites but if I were to pick one it would be the Moen Arbor Motionsense Two Sensor Pulldown Kitchen Faucet. With its motion sensors and smooth water flow, it’s just very convenient to use.